Want to bring more power to athletic pursuits? Build up your balance and stability? Or are you simply hoping to make everyday acts like bending, turning, and reaching easier? A strong, flexible core underpins all these goals. 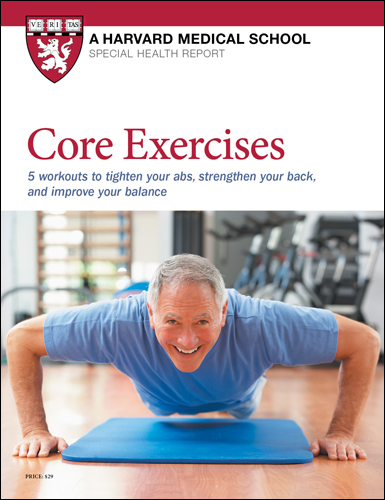 Core muscles need to be strong, yet flexible, and core fitness, like that found in thei Special Health Report Core Exercises: 5 workouts to tighten your abs, strengthen your back, and improve balance, should be part of every exercise program. Want to bring more power to athletic pursuits like running, swimming, golf, and tennis? Ward off or ease lower back pain? Build up your balance and stability so that you’re less likely to fall? Do you dream of running a marathon, or flashing washboard abs at the beach? Or are you simply hoping to make everyday acts like bending, turning, and reaching easier so that housework, fix-it projects, and gardening stay on your agenda? A strong, flexible core underpins all these goals. Your core — which includes back, side, pelvic, and buttock muscles — forms a sturdy central link between your upper and lower body. Much like the trunk of a tree, core muscles need to be strong, yet flexible. A weak or inflexible core impairs how well your arms and legs function, draining power from many of the moves you make. For these reasons, core fitness should be part of every exercise program. In this report, you’ll learn ways to slip these essential exercises into even the busiest schedule. The six core workouts in this report feature exercises that emphasize moves you make during sports and everyday life. We’ll show you how to set achievable goals and work smart, rather than wasting time you’d rather spend elsewhere. Twenty to 40 minutes a few times a week — or even just five minutes a day — is all the time you need. We’ve skipped standard crunches in favor of more challenging exercises designed to buff more than one muscle group at a time. And all of the exercises can be made easier or harder, depending on your current level of core fitness. Which workout should you do? How does core work fit into your exercise plans? Posture counts a lot when you’re exercising. Aligning your body properly is the key to good form, which nets you greater gains and fewer injuries. In fact, good posture helps anytime you’re moving. If one foot is always turned slightly inward, for example, it impedes power whether you’re walking, going upstairs, jogging, or playing sports. Worse, it paves the way for injuries to the ankle, knee, hip, and beyond, since the effects of this physical quirk can zigzag their way up your body. Similarly, sitting up straight and comfortably aligned in a chair can make desk work feel less tiresome. Hours of computer and desk work tend to make your shoulders hunch and your head and neck jut forward uncomfortably. Committing to core work will do much to improve your posture whether you’re sitting, standing, or moving. A balance of core exercises, such as those selected for our workouts, is best. If you only pour your efforts into strengthening abs, your back muscles will grow weaker by comparison. Instead of standing up straight, your body will curve forward. Likewise, posture is thrown out of kilter when muscles lose flexibility, becoming tighter and eventually shortening so that your range of motion is increasingly limited. Among other problems, this can cause back pain. Our workouts are designed to build strength and flexibility in all your major core muscles. Doing any of our full workouts, or the four great moves in our short workouts, can help you avoid such problems. Quick posture checks before and during exercise can also help you avoid injury and squeeze the most benefit from your workout. If possible, look in a mirror when exercising. Try to take a few moments each day to practice better posture, too. body weight evenly distributed on both feet. Whether you’re standing or seated, neutral posture requires you to keep your chin parallel to the floor; your shoulders, hips, and knees at even heights; and your knees and feet pointing straight ahead. A neutral spine takes into account the slight natural curves of the spine — it’s not flexed or arched to overemphasize the curve of the lower back. One way to find neutral is to tip your pelvis forward as far as is comfortable, then tip it backward as far as is comfortable. The spot approximately in the middle should be neutral. If you’re not used to standing or sitting up straight, it may take a while for this to feel natural. A neutral wrist is firm and straight, not bent upward or downward. And neutral alignment means keeping your body in a straight line from head to toe except for the slight natural curves of the spine. When angles appear in exercise instructions, try visualizing a 90-degree angle as an L or two adjacent sides of a square. To visualize a 30-degree angle, mentally slice the 90-degree angle into thirds, or picture the distance between the minute hand and hour hand of a clock at one o’clock.